Just 20 minutes off the Gurgaon-Faridabad Highway, Village Jewel Museum and Eco-Lodge lets you experience quiet village life, and has a dedicated museum space that houses tribal jewellery pieces collected over 35 long years. 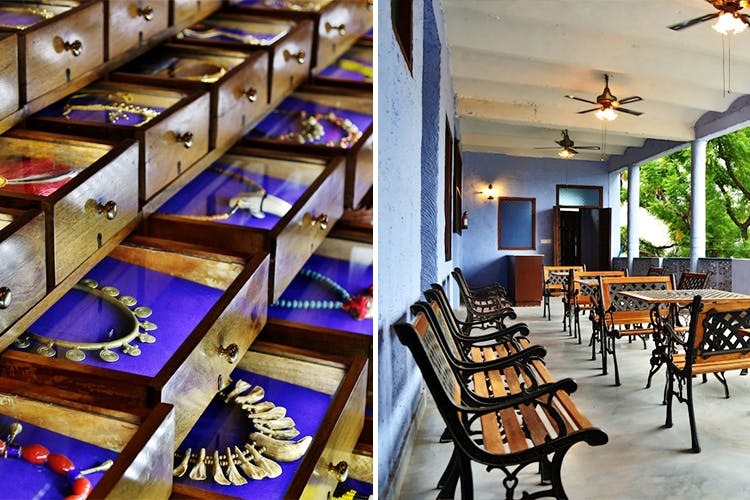 A project of The Kalakar Trust that beautifully combines Mangar village’s scenic location and proximity to the city, this place has a museum on the ground floor, where you can enjoy a mini-date with Indian heritage and a painstakingly-curated collection of tribal jewellery from different parts of India. Checked out the museum? Spend the night at The Village Jewel Eco-Lodge that’s 80 percent run on solar energy, and has six rooms with charpoys, bucket baths and an unmistakable village-like feel. Its charming ambience and affordable pricing has turned it into an artist retreat of sorts, where visitors can opt for a host of regular workshops including yoga, acrobatics, puppet-making, folk dance and dhol workshops to give it that authentic feel. They only take bookings for lodging between September to April, so factor that in.